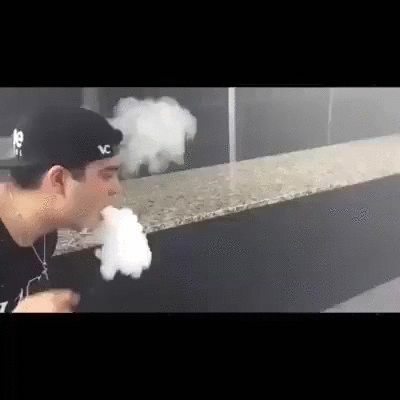 So does anyone here Vape? @Ilriyas THE MUFFIN MAN. Do you know the muffin man? @Ryder Do you know the muffin man? Please don't stop writing these. Any of y'all on this level? Not me, but there are some amazing tricksters out there. Nope that is just residual vapor hanging around in the air. You can't have any air movement from ventilation while doing tricks. I guess I can keep doing these if people want to read them. I know this review is pretty late, but I've been going through quite a few different e-juices and trying them on different RDAs and in different tanks. My box for November came in a couple days ago, and I'll try to get some reviews for that up in a week or so. I got another juice from One Hit Wonder a couple of weeks ago called Rocket Man. It's a blueberry parfait flavor and it's a solid 10/10. Another one I don't think I've mentioned, and is probably my absolute favorite, is "Just Jiffy" from Class E-Drops. If you like peanut butter this one is for you. Turkish delight (the candy) is primarily rose flavored, so that's probably the floral you were tasting. I bought some new hardware recently that I've been very pleased with. The iStick 100W from Eleaf is great for the price($60). It's a simple mod that performs almost as well as some of the pricier mods. It's got some good power and feels great in the hand. The second is the HexOhm v2.1. I've been looking at this one for a while, trying to decide whether it's worth spending nearly $200 on, and if I really need another mod. I finally pulled the trigger and I couldn't be happier. Simple, feels great in the hand, and there's something very satisfying about the button click every time I fire it. I don't have a single complaint. Your review of Tru Blue is spot on. Also gave me a headache. I know I haven't been keeping up on reviews, but there hasn't been much worth reviewing in the boxes I've been getting. I'll just name some e-liquid that I've been enjoying lately and would recommend to anyone. Also, a few hardware updates. The Nobunaga is probably the first RDA that's made me want to ditch tanks altogether. This thing's a beast. I've got it sitting on my HexOhm, and this setup is pure vaping bliss. It's what actually inspired me to write this post today. The Alliance V2 is another nice RDA. I got the "big boy" version(just to have some extra building room), which is 28.5mm instead of the regular 22mm. It looks a little silly, but it performs well. I've got it sitting on a Snow Wolf 200W. The Snow Wolf 200W is a bulky mod and feels quite a bit different than my Sigelei 150W, but with the way it runs my Alliance V2, I think I can get used to it. I gave up on using my Crown tank because Uwell is putting out some real garbage coils. 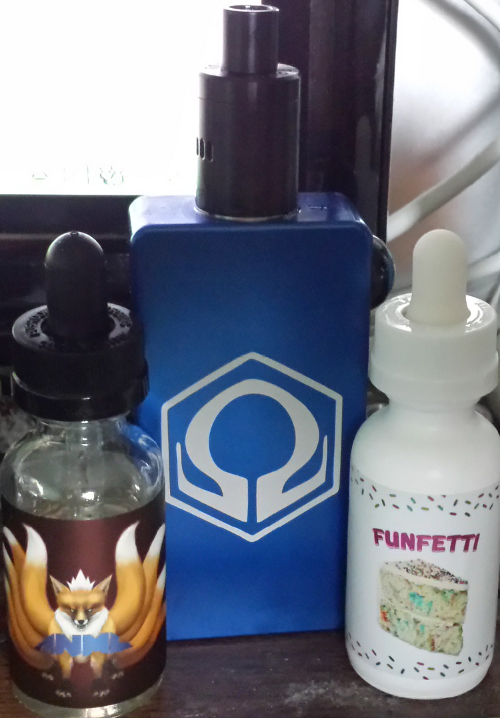 I replaced it with a Mini Super Tank from Tobeco. It's relatively inexpensive, and it's compatible with Atlantis coils and Herakles coils, which is neat. Don't expect anything amazing from it(it is Tobeco after all), but it works well enough for what it is. 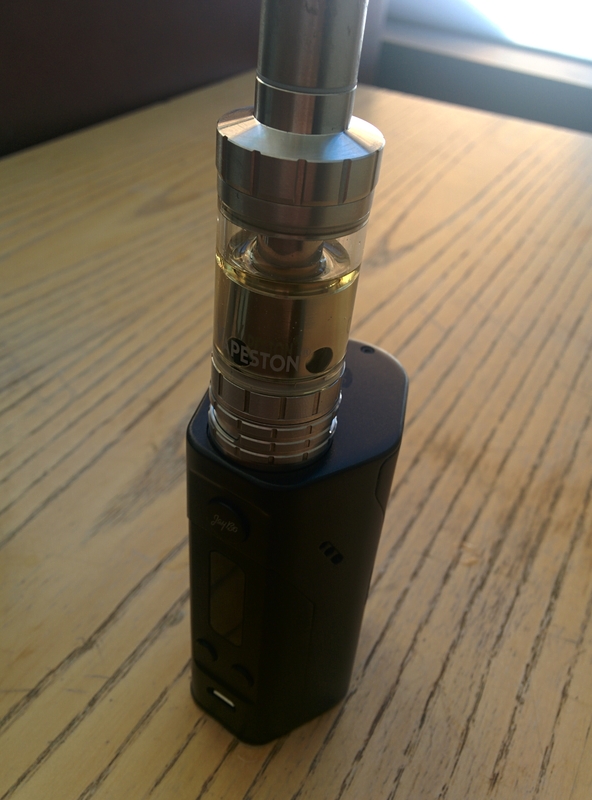 Vapeston Ceramikas tank with a Wismec Reuleaux RX200 box mod. This thing hits like a beast and produces clouds like no body's business. It's a bit heavy as it has 3 batteries in it but can easily gobble up 100w hits all day. I went to VPX (The Vape Exhibit) in Detroit on Sunday and it was an amazing experience. There were probably around 50 vendors, a few being hardware resellers, but most being juice vendors. I didn't get a chance to try everything(I couldn't taste too well after a couple hours), but I did find quite a few things I really liked. I think my absolute favorite is Frosted Nilla Nade from Frosted Vape Co.(vanilla lemonade). I picked up some hardware too while I was there. I got the Mason from Vapergate, which released early for that show. If you like the Alliance, you'll like the Mason. I also got another early release RDA from EZ Cloud Company. The Maker favors flavor over vapor, which is perfect for me. Overall, I'm happy with my purchases and I really hope there's another event next year. If you vape and haven't been to a vape expo, I highly recommend going. I got a new box mod yesterday. I've wanted a custom engraved mod for a while, but couldn't find a place that would do it. I ran into the guys from Ronin Box Mods at VPX, and when they told me they'd engrave just about anything on their boxes, I was sold. A few weeks later I ordered this from them. It's a regulated mod(110W 20 amp) and it vapes like a champ. The RDA on it is a Troll that I got custom engraved from Unleashed Vapors. It's a pretty good atty for the price. I've got a Tiger Wire build in it, and it's putting out some decent clouds. I've started trying more advanced builds, and built my first Clapton over the weekend(26g Mad Rabbit, 32g Kanthal). I plan on building more of them because the vapor production and flavor are excellent.